"Don't let your guard down to anyone who has the potential to hurt you." WHITE: The base of his sternum, and inner legs are colored in a blank canvas, as well as his cheeks and under jaw. BLACK: A saddle looking marking begins to sit heavily upon his withers, and then fawns back down his spine to his tail bone. Coal colorings highlight his facial features such as his eyes, nose, lips, and ears. Lastly upon his chest, you will find a black upside down archway which connects the two front should together. PALE ORANGE: Considered the blanket of the male. This is the color which the saddle sits upon, and crowns his head, maw, muzzle, and bridge. The outside of all four legs are airbrushed with the pale colors of fire, while thick, dark, burning embers of color spread out around his neck, tail, and then slowly blend in with his pallid underbelly, creating unique shadings of orange. Pelt Texture: Outer fur is rough and prickly, but the lower belly is soft. Markings: A faded upside down black arch that runs over his chest. Personality: Very complicated to explain. You’ll see if you meet him. There were four other tiny scraps like himself, wriggling into the warmth of the nettle strewn den, pressed against their mother’s soft flank. Her tired eyes gazed fondly down at four of her pups, but then tightened on the oldest male. He was an exact replica of his father. A knot grew within her pit, as he desperately cried out to her, and with a heavy heart she nudged his frame closer to her and allowed him to suckle amongst his brethren. During the time the five young pups were born, outside the world was in a strange sheet of ice. The terrain was covered in powders of snow, and plants shriveled up, curling back down onto the soil from where they originated. Nothing but the cold, bitterness of the world. Wolves resided mainly in secluded parts of the clearing, one third of the pack was sick and ailed, and many died each day. Only a week before her own pups were born Dime’s mate, Condor, had been killed by the Sickness. Since then, she had fallen into a state of depression. Everyday a new wolf would poke their head in to view over the pups. Some were pleased with the new birth, knowing their pack needed to be built again with healthy members, but some saw the pups as a bad omen. More mouths to feed with so little food. Yet, just the week after the five were born, all the pups got sick, except for young Caro. In a few days the mother awoke to find her dead pups lying next to her, one of them stared off into space, tongue lolled out between his jaws, the other three were curled up tightly next to each other, their bodies gone cold within the night. Caro was found whimpering towards the farther end of the den, his eyes were glued shut and ears folded down. Even as a pup he could sense a danger about being near to his kin, and the cries of his mother alerted him of the distress. That evening Dime buried four of her children. When she returned to the den, she found Caro sleeping in the dent of the earth where her body would usually lay. At that moment, Dime saw just how strong he was, but how dangerously depressed Caro made her feel. Every curve and feature to him spoke of his father, and she feared that when he’d open his eyes they’d be lush green like his sires. If they were, Dime would not know how to react or how to feel. Eight days later revealed amber orbs instead of moss, and the mother gazed down into the eyes of her only surviving offspring. Caro gazed on his mother for the first time, she was beautiful to him. Her coat was glossy, and sleek, it shined in a fiery white, but had patches of blonde strewn through it. Her own eyes were Amber. By the time Caro had reached five weeks old, he was well on his way of eating meat and no longer craved for the milk from his mother. Caro was adventurous as any could be, every single pebble in his way had to be turned over, and every little hole or smell had to be investigated. The pack felt refreshed with his bundle of joy, and he regularly visited with the Elders, hearing the tales of how great the crumbling pack was years ago. For the past month, almost half of the pack had died, and nearly the rest of it had caught the sickness. There were only four remaining elders, three spoke to Caro, the other one hid. Caro was not fully aware of how terrible the sickness was, after all he felt great, and had quite a bit more freedom than a young pup should. 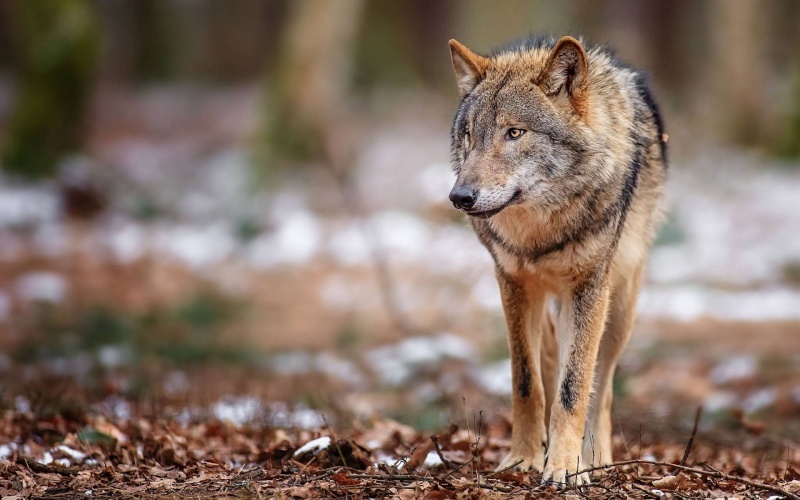 However, even though the pack was warm to him but yet rough, Caro noticed that the most indifferent behavior he got was directly from his mother. He could feel her eyes watching him grow with intense gazes, and would find her staring at him with a painful expression. He didn’t understand what he was doing to cause his mother pain, and he always tried making it up to her, by bringing her any sort of plant life there was he could find in the desolate snowy land, but in the end his mother only seemed more depressed. One afternoon, when Caro and his mother were curled up in the den, a boney grey female came forward into the den. She gave grave news that Dime’s brother Forest, and Dime’s sister Fawn, had both caught the sickness. The look on Dime’s face broke Caro’s heart, devastation was etched in every feature, and she wailed in disbelief before fleeing the den to go look upon her littermates. Caro was then left to himself once again like most days. A few more weeks rolled by and Caro met his seventh week of life. So much had happen within his first weeks. He didn’t remember what his brothers and sisters had looked like, only their scents, but he dreamt about them at night, and chased them around. He began to feel lonely, another elder had died, his mother spent all of her time with her kin, and the other pups were sluggish and soulless. They too became depressed, and all Caro could do to distract himself, was to keep as many wolves company as he could, and tried to shed some light into the dark turmoil of the pack. Halfway through the seventh week, all wolves of the pack were informed their Alpha female had died of the sickness. Overcome and blinded by grief, and Alpha male ordered that the pack were to find new grounds, and were to immediately leave. Caro’s mother stood by his side, and her muscles relaxed upon hearing they were to travel to new lands. However the next words to escape their leader’s mouth suddenly made his mother fear. Caro’s mother and many others howled in rage and grief. Those were common sounds to meet the young pup’s ears. For the rest of the day, the pack was buzzing about the journey which would take place at sun high. Dime immediately withdrew herself from her son’s presence and left to go to the den where the sick lay. Caro later trotted into the den himself, to visit with his mother who refused to leave both her brother and sisters side. He worried for his own mother’s health, if she continually exposed herself, she too would catch it. As he treaded next to her, he flattened his ears against the harsh stench that reeked from the limp bodies. At once a growl was permitted from his mother when he brushed up against her fur, she stiffened, her eyes blind to the world around her, “Now’s not a good time Condor.” She whispered, staring at the stiff bodies that barely breathed before her. Her sister’s eye cracked open, showing evident worry as if she too heard what name Dimed had called her son. “Mom?” began the son, peering at her eyes, and seeing to his horror that they were the stoniest he had ever seen them. A ragged look casted over her features, and all signs of warmth vanished. “Condor. Stop haunting me. Please.” She then whispered with a terrible pleading whimper. The Medicine wolf, River, glanced towards the wide eyed pup. He knew his father’s name. His ears flattened against his skull as he ducked his head and left his mother. There she stood, the fading sun warm on her back, and the grass beneath her toes soft and lush. A sudden handsome figure approached her, his multi-colored pelt prickled with excitement as he neared her. Dime met the moss eyes of the male, and in that moment as his muscles flexed beneath his body, she knew she was undeniably in love with him. As Condor approached, a pleased whine escaped her maw, and the two brushed against one another before the male backed up a few spaces, a wolf-ish grin plastered on his face. Curiously she tipped her head, wondering the truth that was hidden behind that smile. As the night fully approached, and the moon was at its apex, the two become mated with one another. When it was time to rest, Dime sat back upon her haunches and gazed out at the starry night. Only did she break her gaze from the hills when Condor curled up beside her, and bid her a gentle goodnight, before he fell into a blissful sleep. Her eyes observed his handsome features, the way his chest rose and fell with every breath he took…. Suddenly the image snapped, and she was suddenly stripped from her subconscious and thrust into the real world. Something thick was caught in her throat. The pup before her only made her heart ache. Flattening her ears, she placed herself next to him, and let her fur brush against his. Even the texture was the same. A shiver ran down her side, and her heart broke again as if the loss of losing her mate became fresh. She did her best to stifle her aching wails, for her heart bled from the pain of living without the one she loved the most in the world. At that point she knew she would never be able to live, with the haunting memory of her mate. Dawn blushed against the horizon, and many stirred awake to its light. This was the last morning they all had together. Dime rose, and left the den, leaving her sleeping pup peacefully dreaming. She visited her brother and sister, and when the sun began to ascend higher did she leave to find Caro waiting for her outside the medicine den. Her eyes met his amber ones, and a sad look filled her chest. Caro stared at his mother, she looked utterly torn and beat, and he wondered how her heart was even beating. She walked towards him, and she licked the top of his head. Caro’s ears pricked at her sudden affection, and a joy crept into his heart. Bounding to his paws, he scurried away. Already a band of wolves were resting at the entrance to the camp, their bodies pressed together in the cold, the snowflakes falling in careen patterns onto the frosty ground. An adult male, glanced at Caro and beckoned him into the warmth of the bodies. Gladly, Caro accepted the invitation, and there he waited, and waited, and waited. Sun high came, and the Alpha male came forth, and signaled for the band of wolves to follow, without giving the pack a goodbye. Caro stood there refusing to move, his mother had not come yet, so he patiently waited, worry suddenly gripping at his heart. The alpha growled at him to follow, and Caro sank his ears against his skull, but yet refused to move. He couldn’t possibly leave without his mother. Suddenly the old black elder that Caro had never met approached him. His muzzle was stained in white, from his years of life, and a bland expression met his bright blue eyes. Caro looked puzzled, wondering who it was, the old elder pressed his head roughly against Caro’s side forcing him to yelp and back up. “It’s time to go,” came a cracked voice. Caro released a howl of disbelief, fear, and betrayal coursed through his veins. “N-no, she loves me! She wouldn’t leave me!” cried the pup, and he clawed at the snow, trying to break towards the direction of the Medicine den. However, a jaw crushed the back of his hip, and he let out a cry of pain, before a new set of teeth, an old pair, grabbed at his scruff. Forcefully he was lifted from the ground, his hind legs dragging in the snow as he was carried away. Caro’s desperate pleading cries for his mother bounced off the mountains for the next hour, and rang through the valleys. His mother had abandoned him. After two weeks of traveling, the pack finally came to rest in an area that provided everything they could have hoped for. The landscape was built upon stone, and trees grew in the cracked the rocks beneath the boulders. Only a mile or two downwards led out into a valley, rich with quarry, and from the slope they settled down upon, water trickled down into the underground wells every time it rained. A flora as well was farther up the mountain, so the pack thrived on the new conditions. Winter began to thaw, and droplets of water fell here and there from the ends of pine needles, sending a chill to run down the spines of many. However, though this place was heaven to most, it was hell to young Caro. Any place without his mother truly wasn’t home, but a stiff coldness towards the fact he wanted to be with her made him turn bitter towards the thought of his own mother. Other wolves in the pack had offered to take him under their wings, but Caro rejected them, still too wounded to allow any creature access to his broken and mangled heart. The pup growled, and slashed his tail, “I can take care of myself.” He argued. Raven twitched his ears, his thin boney body tensed, “Do you think I really care?” his snarl rippled down from his throat, causing Caro’s hairs to stand up, “If there was another way for you to manage I would allow it. However, you’re stuck with me till you’re older to fend for yourself. Got it?” lips curling the old wolf turned away from the pup and trotted off wards towards the dead carcass that lay in the camp. A bitterness clawed at Caro’s insides, but he did not argue with the elder. Later that night he spent his first starry night in the presence of the old male, Raven, who had told him his name, when he entered the den. Then time crept on slowly, day by day, hour by hour. Caro’s interactions with Raven were very little. They never groomed one another nor greeted each other. Simply they shared a nest, and Raven would bring in food from the hunting party. When Caro was old enough to learn how to hunt and battle, he was appointed a mentor, and every sunrise till every sunset he was out training. Training with other apprentices was not Caro’s best skill, he didn’t like competing to see who the best was, and he kept a distant and awkward relationship with his mentor. No one got close to Caro anymore, except for old Raven. Caro had assumed Raven was born grumpy, but after a hunting party with a senior wolf, Caro was then told a story he had never been aware of. Colossian, was the wolf’s name, who presented the story. They had been eating, when other pups had gathered around so they may too hear of the strange elder whom never went out and conversed with others. “It was three years ago that Raven became the male he is today,” began the elder, “and it occurred just after the death of Raven’s mate.” Caro had been laying idly by, but at the mention of Raven his ears had pricked upwards and honed in on the conversation with mild interest. Even he didn’t know anything about Raven, except that he was obviously old, and very grumpy. “Raven and his mate had been best friends as pups. Everyone around the pack could see the obvious signs that they would court when they became of age. And so they did. Together Raven and Fern, his mate, became parents, and had six young healthy pups.” A few murmurs of surprise rippled through the adolescents nearby. The thought that Raven could have ever loved someone, was beyond them. Caro’s ears flattened at their surprise, they didn’t know the pain one could go through to cause such a tragic change in one’s personality. “They should’ve just killed him,” muttered a pretty white wolf that was sitting in front of Caro. The young male wolf growled at her, and suddenly a pair of steel eyes met his, her ears flattened back in embarrassment, remembering that Raven was the caretaker of Caro. The old wolf’s eyes seemed to fog as he disappeared into another time, “Demetrius was so angry, and ashamed, this was a huge loss to his rank and status in the pack. Yet, he was a noble wolf, and kept his head high, and respected the fact that he lost, though it took time. After that, the pack figured everything would settle down, and tension between the two would fade. After all Raven seemed beyond content with the life he had, his love for his mate was evident, and it was powerful, just as powerful as his love for his pups were. Nothing could have separated the family, which is why it broke Raven when his mate and pups were killed.” Caro’s eyes widened, he dropped his rump to the ground, and leaned in farther, aware of a silver pair of eyes that watched him most curiously. Caro hardly ever socialized or took part in pack activities. Raven appeared from the shadows, he had been listening the whole time. His ragged frame charged away, disappearing into the den him and Caro shared. The young male wolf suddenly sprung to his paws, and loped after the old ebony male. He didn’t need to hear the rest of the story to know why Raven was the way he was. However, Caro also had questions of his own. Skidding into the den, he found Raven breathing very heavily, maw lowered to the ground, his legs wobbly and unstable. He lifted his white chiseled muzzle towards Caro, his piercing blue eyes, which were indeed void of any emotion besides anger, glared into Caro’s own amber. “Why do you want to know?” spat the elder, a grizzly look haunted his frame. “I just want to know your reason.” Caro murmured, taking a step closer, “I won’t think of you indifferent.” There was a long quiet pause, the only sound was the wind gently whispering inside the cave. Raven continued to meet Caro’s gaze, until it dropped to the floor, “I cannot give you a reason, Caro.” He murmured softly, the satellites upon his head dipped down, pressing against his skull. Irritation itched at his skin, “Why not?” he pressed. “I’m aware.” Hissed the elder, who now faced him, chest for chest, and peered questioningly down at Caro, “but no one would listen to me when I pleaded innocence. The only one who did, was Fern, but even then… I knew she had her doubts.” His voice cracked at the mention of his mate’s name. Raven then rested down onto his haunches, and Caro mirrored his caretaker’s positions. “The nephew’s name was Ransom. He was the smartest pup I had ever met. I didn’t hate him, I had nothing against Ransom even though he did share blood with Demetrius. That morning, I had taken out Ransom for a first hunting assessment, but before we set out I gave Ransom a small lesson, which involved us rough housing, which is how I believe my scent stuck to his pelt. When Ransom finally set out, I followed him here and there, but then at one point his trail ended, and I could not find him. It was as if a barrior had clogged up my nose, and every scent in the forest disappeared. I searched for him, but after not finding him, I ran back to camp, to get help to find the missing pup, but when I arrived Ransom’s body was in the clearing, and Demetrius was hovering over it. All at once, before I had a chance to get any words out, I was surrounded and put under arrest and trial for murder. I tried to plead innocent, but no one listened to me, my scent reeked over Ransom’s body, and later in the night…. Well he died. Caro passed through his yearling years, before he took on the apprenticeship of an herbalist. He was appointed River as a mentor, and for the longest time he shunned any attempt she had of getting close to him. Every time he looked at her, he remembered the time his mother had called him his father’s name. The thoughts of his mother always soured his mood. The only thing River had told him that he had always taken to heart was something she told him on a starry night as he looked out over the territory. “Then we learn to create them ourselves.” She murmured. That moment impacted Caro’s look on life in that moment, and will forever continue to do so. A pair of silver eyes stared at him, her body laying upon the crisp snow. Blood dripped from the side of her temple, fawning out in petal like droplets. Caro gazed down upon Shard, her chest rising and fallen with quickened painful breaths. Next to him lay bundles of herbs, and he quickly tore through them, until he found the leaves he needed. As the procedure continued on, her breath became steadier, and her eyes filled with renewed strength. When Caro finished she opened her eyes, and gazed upon the young adult, who stared at her with eyes filled with relief. When Caro came of age he dispersed from the pack, to find his own life He had no attachments left in the pack, the closest thing he had was Raven and Shard. Many believed him and Shard were to court, but her love was given to another male. Raven was the closest thing Caro ever had to a father, but even then his attachment to him wasn’t nearly strong enough to make him stay. On the day he was to leave, Caro visited Raven to thank him for providing for him as a pup. Raven nudged Caro, secretly his heart broke to see Caro, the closest thing he had to a son, leave him and the pack. But he would not ask him to stay, nor hold him back from a good future ahead of him. He wanted that for Caro, but he needed him to know something before he left. Caro had a picture of what Raven meant. He knew everything Raven had gone through, and everything Caro himself had been through. Nodding, Caro bid his only childhood father goodbye, and left. From there he set out to find a new pack. Dislikes: Pups, large crowds, and cramped spaces. Fears: To come into contact with anyone from his past, primarily his mother. Lover: Slowly his heart is falling for Winter. Pups: He wouldn’t be able to tolerate his own. Scent: He smells of the lakes and rivers. WELCOME TO THE PACK NICE BIO UGH. And yeah I know the history is loooong. It killed me to write it all out (/.\) lol.